Designed by the Alfa Romeo Style Centre, and inspired by the brand’s legendary racing history and classic models, the all-new 2015 Alfa Romeo 4C is distinguished by its stunning mid-engine proportions and essential elements that directly contribute to the coupe’s lightweight, precise function and high performance. Designed to be “The Alfa of Alfas,” the all-new Alfa Romeo 4C immediately recalls some of the brand’s most iconic models, including the lightness and efficiency illustrated by the aluminum-bodied 1938 8C 2900 B Touring; the 1952 1900 C52 “Flying Saucer” that could exceed 140 mph (230 kph); and most notably the legendary 1967 33 Stradale, the homologated version of the racing Type 33. Considered one of the most beautiful cars of all time, the 33 Stradale left its mark in automotive history for its designed-for-performance philosophy: a road car that combined extreme mechanical and functional requirements with an essential style, which “clothed” the engine and magnesium alloy and steel tube chassis with unmistakable Alfa Romeo design. 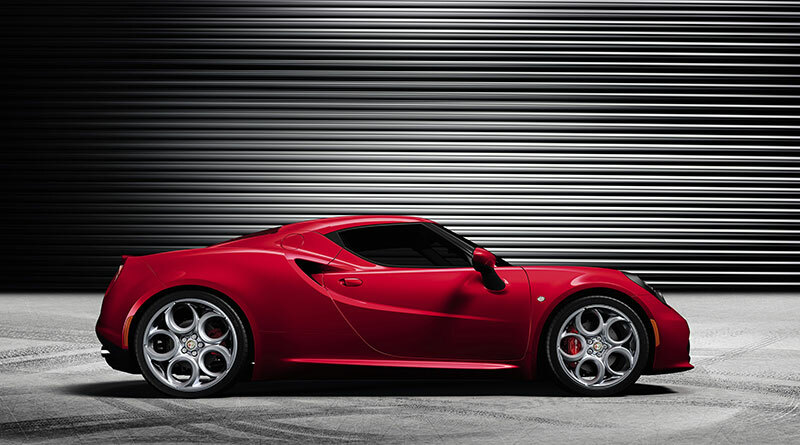 The 4C relives these Alfa Romeo traditions in state-of-the-art form and shares the same lines as the 33 Stradale. Similarly, its low density, Italian-styled composite body provides the covering for the carbon fiber monocoque, aluminum engine frame and high-performance turbocharged engine. The 4C also marks another milestone in the Alfa Romeo brand’s journey, which was embarked upon with the 8C Competizione (2008) and 8C Spider (2009) – continuing the design theme of compact size, dynamism and agility. 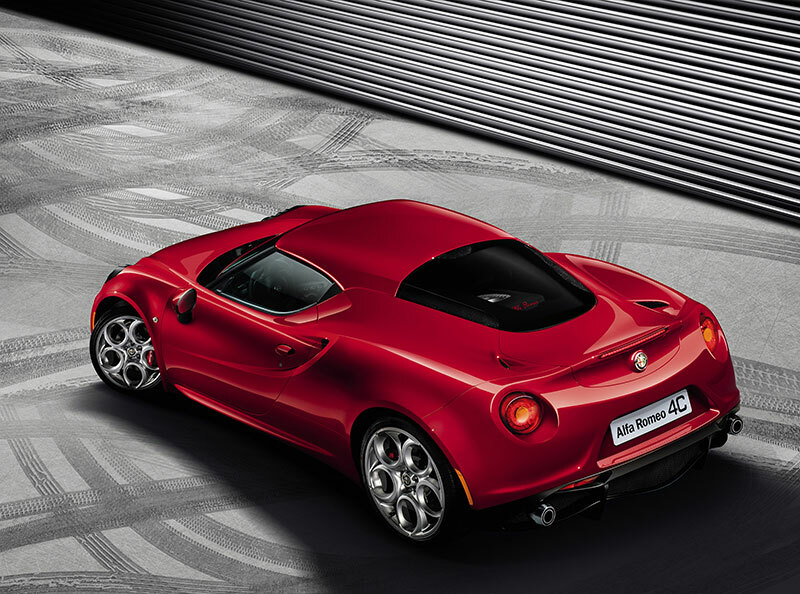 From the start, Alfa Romeo designers sought to style the 4C in a way that exuded technical characteristics both from a dynamic and aerodynamic point of view, all toward the ultimate goal – maximum performance. The beating heart of this Italian supercar is its centrally mounted 1750cc engine, visible through the back glass window, which provides insight to Alfa Romeo 4C’s advanced technology within. And it’s from this beating heart – where every other element of the car’s design starts: the round rear LED illuminated light clusters blend into the muscular rear wings for a powerful stance, while also incorporating functional air intakes needed to help cool the engine. From this energy-charged rear volume, the two side air intakes spring two long muscular forms, which provide a dynamic look and elegantly lead into the headlamps. Additionally, the hood is formed with two robust ribs that trace the unmistakable V-shape lines, which naturally conclude at the signature Alfa Romeo shield-shaped grille and emblem. Together with two side intakes designed in the front fascia, the 4C forms the famous “Trilobo,” a substantial facet of Alfa Romeo’s profile. The all-new Alfa Romeo 4C’s compact dimensions are truly unique and add to its light weight and agility. With dimensions of 157.5 inches (400 cm) in length, 73.5 inches (186 cm) in width and an extremely low 46.6 inches (118 cm) in overall height, this new Alfa Romeo exudes proportions of exotic supercars. The Alfa Romeo design team, in working with the vehicle’s engineering team, created a coupe that achieves maximum aerodynamic efficiency levels – with a drag coefficient (Cd) of 0.335. 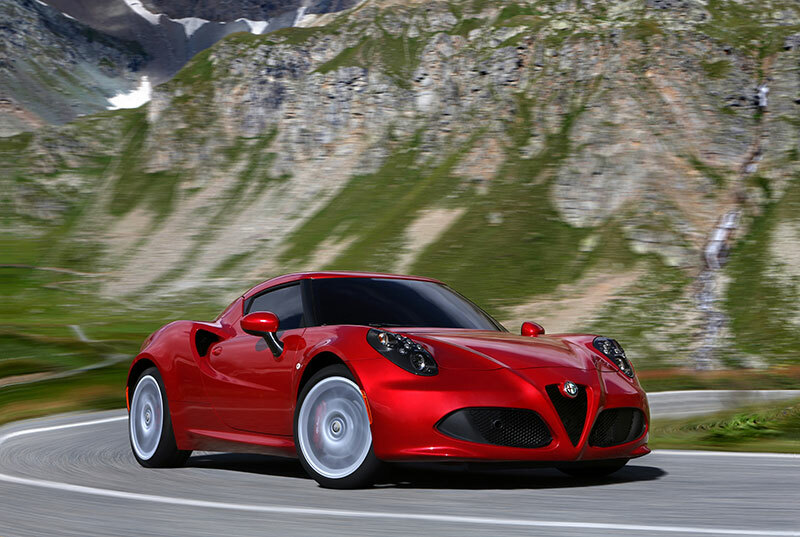 And like race cars, the Alfa Romeo 4C is designed contributes to increased stability at higher speeds. 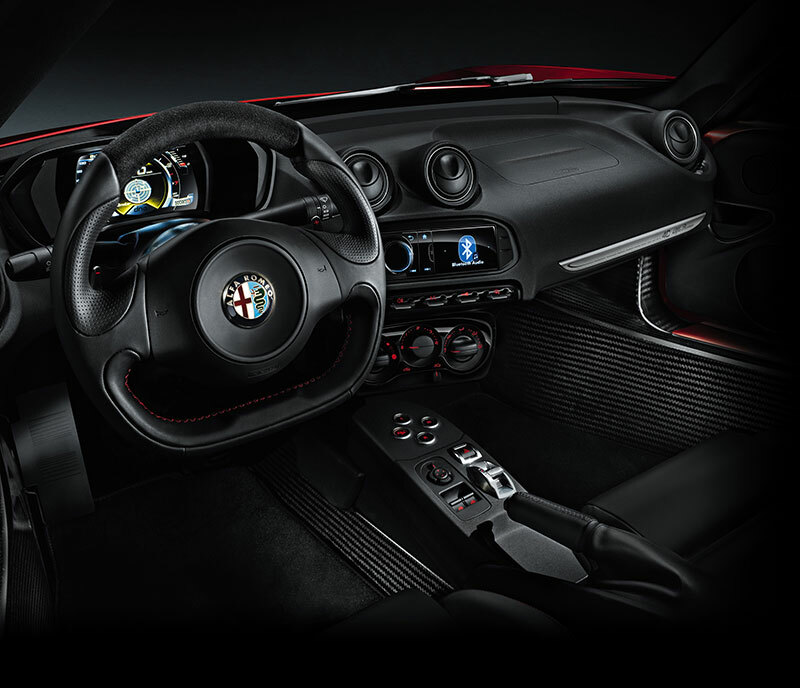 With inspiration from the legendary 1967 33 Stradale and an interior comprised of elemental and essential components, entering the interior of the all-new Alfa Romeo 4C means entering a world derived from motorsport. Most notable to Alfa Romeo 4C passengers is the stunning, exposed carbon fiber monocoque surrounding the passenger compartment and highlighting the coupe’s lightweight and technological uniqueness. The interior expresses the racing spirit of Alfa Romeo. The dashboard and door panels have an “asphalt” treatment that designers selected to convey a maximum driving sensation from the road. A thermoformed dashboard shell is similar to those found in ultra-exotic supercars and is available fully wrapped in premium leather. Inspired by motorcycle racing and race cars, the cockpit features a clean and functional design with a flat-bottom performance steering wheel with paddle-shift controls. Driver-oriented center stack controls, along with aluminum pedals and footboards, highlight Alfa Romeo 4C’s track-oriented spirit and attention to detail. Emphasizing the Alfa Romeo 4C’s advanced technology and focus on weight reduction is a 7-inch full-color thin-film transistor (TFT) instrument cluster that replaces the traditional analog gauge cluster. With its simple, high-impact graphics, the display enables the driver to stay focused on the road, or track ahead. Two sport seats feature a carbon fiber and fiberglass reinforced-composite structure to deliver the strength and weight savings. Available in cloth, leather, and leather with microfiber, the Alfa Romeo 4C’s seats provide the posture and bolstering needed for performance driving, while giving the comfort required for everyday use. Ergonomics are of extreme importance during high-performance driving, and the all-new Alfa Romeo 4C perfectly positions the steering wheel, instrument cluster and vehicle controls for the driver. Additionally, the vehicle is designed to maximize interior space and comfort for taller passengers, while also allowing for ease of entry and exit – characteristics seldom found on supercars.